Yesterday, Kamen Rider Drive's Rei Yoshii who portayed Krim's partner in crime, Rinna Sawagami, has announced in her blog that she had married actor Shigenori Yamazaki. Rei met Shigenori while working and had a reunion last year. She also wrote on her blog that it would be difficult for her to bear a child because of the bone marrow transplant due to Acute Myeloid Leukemia that she had 16 years ago. It was a really hard decision for her to make as she wrote an apology letter for her unborn child before the said transplant. But despite all of this, she still finds happiness with the man the she dearly loves. 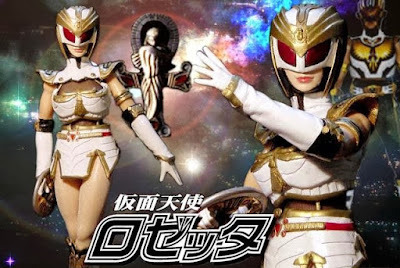 Rei Yoshii first debuted as lead role in the tokusatsu series Kamen Tenshi (Masked Angel) Rozetta that aired from July 4 till September 26, 1998. We at JEFusion, specially me that is a solid Kamen Rider Drive fan, congratulates the newly wed couple and wishes them a great future and happiness.